One of the most popular programming languages, Java offers a range of language-related libraries, tools, and frameworks, enabling the developers to leverage its power effectively in technology space. The frameworks that have been used include back-end development, game programming as well as application development. Spring framework is one of the widely-used and popular Java frameworks that enable web application development for enterprise-level Java. If you are looking for a book that enables you to understand as well as code your program in this framework, this is the best choice. This is due to the fact that it offers an in-depth understanding of this framework in simple and easy language. Further, it also offers many examples of every concept so that the reader can build a good understanding of this framework. This book not only covers the basic concepts of spring such as dependency injection, and bean configurations, but also introduces some new concepts such as spring data JPA and java based configuration. Throughout the book, the author keeps a practical approach towards the learning of the spring framework. 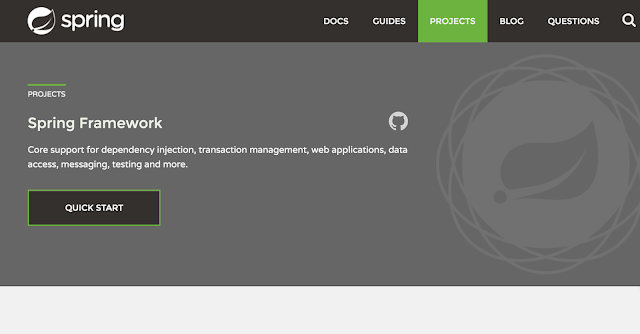 If you want to know what Spring framework is all about, this is the best choice for you. The book offers extensive information about every facet of this framework that ranges from core bean dependency injection to database simplification with JDBC to UI development with Spring MVC. This book is the best addition to everyone’s library collection that ranges from a beginner to the advanced Spring developers. Not only this book offers a quick reference to Spring 2.5 for any practical project, it also offers a very comprehensive compendium of the Spring portfolio technologies that is available in the market. Today, the Spring framework, a lightweight, agile, open-source framework offers a leading a leading enterprise Java application development framework for the current Java developers and programmers. As it works with other Java technologies such Groovy, Hibernate and MyBatis among the others, this framework offers extensive opportunities for development various kinds of applications. The book also offers a full application that enables you to apply various technologies and techniques that are covered in this book. Not only that, the reader also learns to leverage this framework for building various parts or tiers of an enterprise Java application such as the presentation and web tiers among the others. This book offers a practical, hands-on style to teach Spring Framework as it is becoming more popular day-by-day across the world for the development of the software applications. While teaching programming this book offers a special knack for entertaining and crisp examples that zooms in various techniques and features that is required by the user. This book highlights various aspects of Spring Frameworks such as remote services, Web Flow, Messaging, REST and much more. Whether you have just started to learn this framework or you just want to absorb new features, this is the best method to master Spring than this book. If you are building a Spring-based application and require a quick reference, this is the best choice for you. This book offers extensive information about a wide range of uses for both common as well as not-so-common scenarios while building an application. With a set of simple abstractions, the development of an application becomes easy with simplification of construction, testing as well as deployment. It is due to the fact that this book enables and empowers the software programmers and developers for resolving various concrete business problems by mapping application-level issues such as recurring themes such as transactions, Hibernate and Spring MVC. If you want a practical guide that offers quick reference for the development of the web application. The writer offers extensive information about every step with practical examinations. This information that is includes the tutorial, along with information as well as various other downloads that are available on the writer’s website. The information that is given on this website also includes the information that enables the user to complete a basic web application project in a very short period of time. if you want to get a feel for both Spring Framework and Java, this is the best book that explains the complex issues in a very easy way. If you are a beginner, and require a book that explains the complex code at every step in a very easy way this is the best book for you. There are many books on the market that offer extensive information about Java or Spring framework, but this is a very rare book that where the user can get access to small and big tips and tricks that can be used to enhance the quality of the web-based application in this framework. Thus, if you are experienced and would like to know small things that enhance the quality of the program, this is the best choice for you. Whether you are a novice to Spring Framework or are an expert in this framework, this book is an invaluable work that should be the part of your reference library. This is due to the fact that it offers extensive information about the online spring integration docs. This book offers step by step process of the creation of the web application in the spring-based environment. For a novice programmer, this book offers a lot of information that enables him or her to create applications that are user-friendly as well as sophisticated in looks as well as function. From coverage as well as working example perspective, this book is excellent from the both side. The writer covers the extensive topics with the introductory matter with the detailed aspects. The book is targeted towards the newcomer to this field as well as to the experienced software programmer who requires an in-depth knowledge of micro services in Java with good examples. The best part of this book includes the narration that has been provided by the author for the selection in relation to the software architecture of PSS or a fictitious Airline Passenger Service System. The latest version of this book offers a good introduction to the spring framework environment and offers a new concept of this framework very well. The writer has also explained this concept in a very easy and simple way so that every reader who would like to learn spring framework for the growth of their career. Written in a bottom-up style, this is a book who prefer the hands-on type of learning. This is also the best book for the readers who are new to this software and who like to learn new concepts in the Spring framework environment. If you want to know about the current Spring Release (1.2), this is the best possible choice for you. As this book offers a significant depth and covers various concepts such as Spring JDBC, Persistence, AOP, Acegi, and Spring MVC among the others. Some of the major features of this book offer extensive information about the new Spring 1.3 release that is awaited by the programmer. The main advantage of this book includes the fact that not only explains the Spring Functionality but also offers explanations regarding the decisions that has been taken of various implementation options. One of the most popular as well as widely used Java Frameworks, Spring Frameworks is mainly used for web application development for enterprise-level Java. This is due to the fact that if offers a collection of the modern features such as support for aspect-oriented programming, DI or dependency injection, and robust authentication among the others. One of the most popular as well as widely used Java frameworks, Spring Frameworks is mainly used for web application development for enterprise-level Java. This is due to the fact that if offers a collection of modern features such as support for aspect-oriented programming, DI or dependency injection, and robust authentication, among other unique features.